Information and news about Texas players (current, former or future) playing for their national teams. Both Kelly Wilson and Nikki Thaden will play for the U-21 national team as they try to win the Nordic Cup in Iceland, over July 23-29. Chris Petrucelli coaches the U-21 team as well. The U-21 team has been very busy traveling the world, having already been to China and Brazil in the past few months. USA beats Finland 3-0 in Group B opener - Kelly Wilson gets an assist. USA beats Norway 3-0 in second Group B match - Kelly Wilson scores two goals and gets an assist. USA beats Germany 3-0 in final Group B match, and will now face Sweden in the final game. USA beats Sweden 3-0 to win the Nordic Cup! Kelly Wilson scored one of the goals. Kelly Wilson has played great with the U-21's, and Thaden must have gained some great experience. This bodes well for the Longhorns. 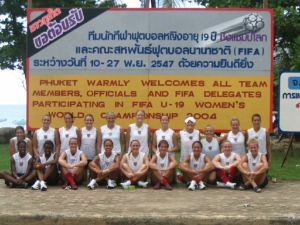 The U-19 national team is heading to Phuket, Thailand for the 2004 FIFA U-19 Women's World Championship, with Longhorn recruit Stephanie Logterman on the roster. The USA has its first game against South Korea on 11 November. The USA won its first game, against South Korea, 3-0. The USA won the second game, against Russia, 4-1, and will advance to the elimination round. Logterman has played all of the two games so far. The USA beat Spain 1-0 in the final group play match, and will now face Australia in the quarterfinals on Sunday 21 November. The USA beat Australia 2-0, and will now face Germany in the semifinals on Wednesday 24 November. The USA fell to Germany 1-3, and will now face Brazil for third place on Saturday 27 November. 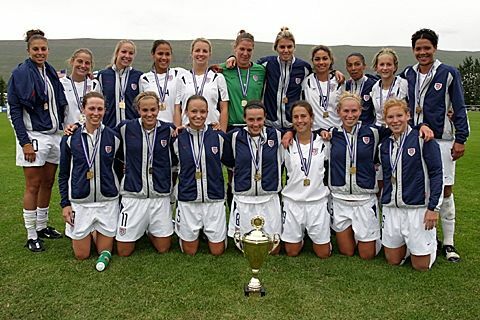 The USA beat Brazil 3-0 to claim third place in the U-19 Women's World Championship. Stephanie Logterman played every minute of the tournament for the US. Fortunately, this tournament was in November, not in December. On 26 December, a huge earthquake, the most world's powerful in 40 years, struck near Indonesia and caused devastating tsunamis. These devastated much of the coastal areas of southern Asia, including Phuket. Over one hundred thousand were killed. The team's hotel was right on the beach, which would not have been a good place to be.